46 The Journal of Commerce | October 1 2018 www.joc.com Customs Update Susan Kohn Ross WHILE WE'RE ALL understandably caught up in the US trade war with China and wait to see whether addi- tional tariffs will be imposed on more Chinese-made goods, the US Trade Rep- resentative has released revisions in the US-Korea Free Trade Agreement. 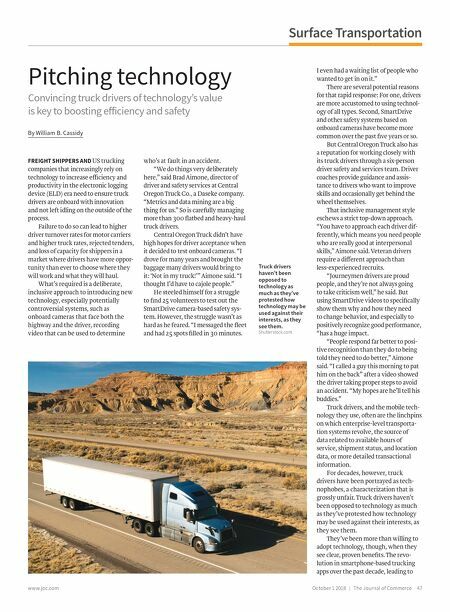 Changes include extending the duty reduction on trucks that now go to zero duty in 2041; Korea doubles to 50,000 the US-made vehicles permit- ted per manufacturer per year; vehicle testing requirements are to be harmo- nized, and US testing is accepted in Korea; Korea will expand eco-credits and fuel economy standards; pharma- ceutical reimbursements will become compliant regarding Korea's Premium Pricing Policy for Global Innova- tive Drugs; and Korea will address concerns about how it conducts origin verification audits. As a result, Korea became subject to product-specific quota levels regarding the 232/steel and aluminum tariffs. Certainly, the auto industry is happy that the market access door was opened a bit wider, but what more is there? US domestic industry, which relies on anti-dumping and countervailing duty, will be pleased by some attempts at greater trans- parency, including advance notice of in-person verifications; prior to initiation, the respondent is to be provided with a list of the topics to be addressed, including the types of supporting documentation required; any written report must describe the methods and procedures relied on and the results, and be made public; and the investigating authority must disclose to each party receiving an individual rate, an easily understood explanation about the calculations so the party may easily validate those calculations, including source refer - ences, and allow time for a response. The broadest benefit undoubt- edly comes from attempts at greater transparency and certainty regarding verification audits. Article 22.2.3 calls for the creation of a Joint Committee to oversee implementation of the agreement. That Joint Committee is to establish a Rules of Origin Ver- ification Working Group under the Committee on Trade in Goods to: • Seek to resolve concerns arising from verification of origin claims • Develop further guidelines to address systemic concerns with ver- ification practices and prevent such concerns from arising • Monitor verifications taking ex- cessive lengths of time or that don't seem to be reaching conclusion • Present findings, reports and rec- ommendations to the Committee on Trade in Goods as appropriate The attachment lists the relevant principles to follow: • Knowledge-based self-certification that allows the certificate of origin to be completed by the exporter or producer regardless of location or address, and permits minor (unde - fined) errors or discrepancies in the certification, questionnaire or other documents to be corrected without penalty and upon at least five work- ing days' notice • Verifications are to be conducted through information requests to the importer, exporter, or producer (not others) • Reaffirm that verifications will be conducted only where there is doubt as to the goods' originating status and based on risk management principles that facilitate the movement of low- risk goods • Provide written advance rulings, in lieu of verbal advice • Increase efforts to ensure that verification information requests clearly identify the specific goods being verified, are limited in scope to that necessary to determine the origin of the goods under review, and includes providing clear guid- ance to importers, exporters, and producers regarding specific infor- mation required to prove origin • Endeavor to conclude verifications expeditiously, typically no later than 90 days after receiving the necessary information, and no later than 12 months from initiation, allowing for extensions in exceptional cases. Article 15 of the Korea-US agreement deals with electronic commerce. There were no changes to those provisions, even in the face of the festering di minimis issue perplexing US authorities, and surely since the trade agreement is more than 10 years old, those provisions could have used an update. Given the rules of origin in the Korea-US Trade Agreement are similar to those in other agreements, do international traders really think changes aren't needed there, either? The closest we get to a change in those rules is an agreement by the US to expeditiously process a request from Korea to treat certain products on the basis of a lack of commercial availability. In particular, that request is directed at yarn classified under 5108, 5403.39, 5504.10 and 5507.00 in the Harmonized Tariff Schedule. Perhaps most striking is the glaring omission of anything to do with trade in services, one of the fastest-growing sectors of the US economy. When taken as a whole, there isn't much to talk about. The only other noteworthy provision is one where - by Korea agrees in 2018 to revise its Premium Pricing Policy for Global Innovative Drugs, meaning it will quit giving such obvious benefits to local drug companies when it comes to pric- ing their products versus those from foreign pharmaceutical companies. While not meaning to undercut the advances the agreement does con- tain, was the outcome really worth the hoopla? JOC Susan Kohn Ross is an international trade attorney with Mitchell Silberberg & Knupp in Los Angeles. Contact her at skr@msk.com. 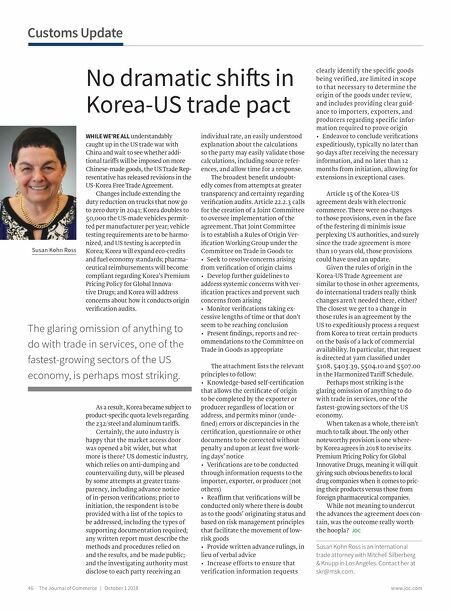 No dramatic shis in Korea-US trade pact The glaring omission of anything to do with trade in services, one of the fastest-growing sectors of the US economy, is perhaps most striking.